So I madly rushed to put it up! So sorry guys it’s 5 minutes late! Who waits till midnight? I just assumed people read it in the morning! Debbie: Great to hear from Bessie, Drew, Paige, Kathrine, Kat, Emaria & others in comments after the last comic, who have been doing NaNo when they were teens (or who ARE teens). For fellow NaNoRebels out there who are writing picture books in addition to novels: PiBoIdMo (Picture Book Idea Month) registration is open until Nov.7th. Also, aspiring kidlit/YA writers & illustrators should check out KidLitCares, where editors / agents / writers / illustrators are donating talent to an auction for raising funds to help Red Cross post-Sandy relief efforts. This entry was posted in 2012 and tagged 2012, ed, fran, victoria. Bookmark the permalink. LOL! Hope your NaNonovel’s going well, Falon. Morning? Is that a thing? Heh. Unlike Errol, I tend to crash early & wake early — so I usually don’t see Errol’s comments (the one he posts under the comic) until I check in the morning. Hm…maybe I shouldn’t say “unlike Errol” since he also seems to wake early. When does Errol actually sleep? Maybe he NEVER SLEEPS. Both Errol & I are in Eastern Standard Time, Frodosco. And I love your userpic!! Are you looking forward to The Hobbit? ME TOO! I need to update WaitingForFrodo.com. I mean WaitingForBilbo.com, sorry. WaitingForFrodo.com was my comic about the LOTR trilogy. heh. I work overnights. Of course I read web comics in my down time. Silly Errol. Evil Queen is a cool username. Beware of anyone who says “Yo” in the 21st century. They are cool, but not necessarily up-to-date. I think I’m going to like Ed. In a “would cheerfully strangle him if we ever met in real life” sort of way. Haha, exactly, Kell. Watch out Ed. I know people like that. Actually, I know people who’d be either the strangler or the stranglee. Ed is doomed. My friends say yo, but they’re no longer teenagers. Kell — pleaseplease feel free to suggest a “yo” replacement for future comics! Errol and I still haven’t written all of them yet. I think it sounds right, I just couldn’t resist making an obscure Discworld reference. I don’t know what to suggest in its place. It’s been *mumble* years since I was a teenager. Hey, I’m on GMT here, so I obly check them in the morning because of the time difference- midnight your time is 5am over here, and if I’m at work in the morning I wake at 6am- and I will check NaNotoons before heading for work. 😀 I wondered what “obly” was supposed to be. Maybe nobly. I was picturing you nobly checking the NaNoToons site. And I LOVE YOUR USERNAME!!!! Oh my gosh I have friends like Ed. XD I think I’m going to love/hate him. I can relate to staying up to see the new NaNoToon. I have a tendency to check in on these more than once a day so I am going to fill in with reading the older ones. I can hardly wait! How’s your NaNoNovel going, Dorothy? 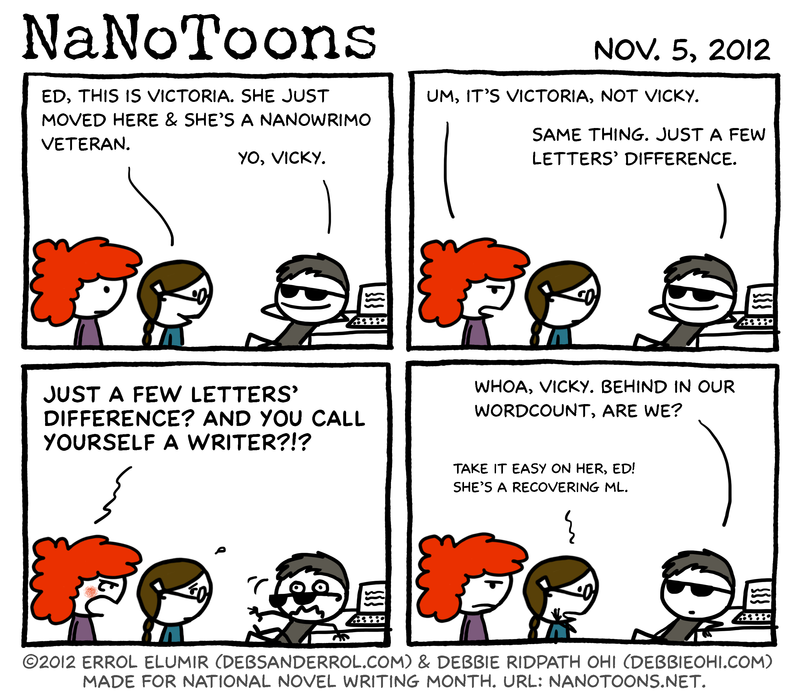 Yay for teen NaNoWriMo writers!!!! YAY another teen! I am not alone in this Nanoworld!! Looks like we’re in for some fun with Ed. I have a feeling that Victoria won’t like Ed very much. Awesome comic, I feel the heat rising. Hey, these are cool! Only found them recently. I’m fourteen and this is my first NaNo which is very exciting and also very motivating. I’m so glad I found out about it and wish I had ages ago.